how to maximize your space. Do your clothes fall off the hangers and onto the floor of the closet? Are your hangers tangled and sagging under the weight? People who hang their clothes on wire hangers are more likely to answer in the affirmative. I find that plastic hangers do the trick but it is important that you check the size so that they fit your closet space. Is there a rod that spans the length of your closet? If so, then your closet has the standard closet organization system. Hanging from the rod are your clothes...BUT do you notice that there is a large unused space under your clothes? To maximize your closet space here you can use attachable hangers.These types of hangers have hooks in the center that hold other hangers and so allow you to hang several garments. means that you don't have to take the hanger out of the closet to remove the slacks. Are your shoes and handbags stuffed in the bottom of your closet? Do you want to organize your closet and manage your accessories? If you want to find space for your shoes, sweaters, ties and handbags, then you are in the right place! 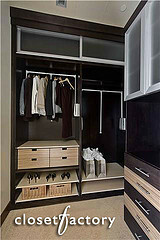 An effective method for this is to create smaller, more manageable spaces out of a larger closet space. These smaller spaces should represent the spaces required to store each accessory. For example, if you have a shelf in your closet use a shelf divider to divide the shelf into storage for sweaters and shirts. Another example of this divide and conquer strategy is the use of drawer dividers.You can use drawer dividers for your socks and underwear, but they can be useful for gloves or hats also! Whatever method you choose, use one that suits your needs and fits with your closet size. Do your shoes kick around in the bottom of your closet? Are you wasting space and your time trying to find the right shoes? If so, then there are a number of flexible ways to organize your shoes efficiently. One method of storage is the traditional shoe rack which can be tailored to fit the size of your closet. However, there are many other options. One is the over-the-door shoe rack that could be more space-saving for you. Closet organization is about reclaiming space. If you liked this article then you may like these simple steps to reclaim space in your garage, your home, or your home office.